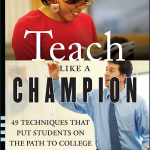 Teach Like a Champion is a recent book by Doug Lemov. Despite the cheesy title, I found it interesting, inspiring, and useful, and heartily recommend it to any teacher facing classes (the techniques are probably less useful for teaching one on one). The book was written from a US K-12 (kindergarten to twelfth grade) perspective, so is a perfect fit for teachers working in elementary or junior high schools. Not all of the techniques are suitable for high school or university students, but a lot of them are, particularly in Japan, so even teachers working at those levels should consider it. This mindset permeates the book, and makes it very persuasive. The idea of the opportunity cost of classroom activities is a simple one that I had never really thought about specifically. On reflection, my benchmark activity teaching English in Japan is extensive reading. Now, for me to do something else in class requires that it be more profitable than ER. Using this idea makes a huge difference to lesson planning. I really like how Lemov brings a critical eye to classroom practice, making the overall tone of the book one of experimentation. The bulk of the book, however, is taken up by 49 very specific teaching techniques. 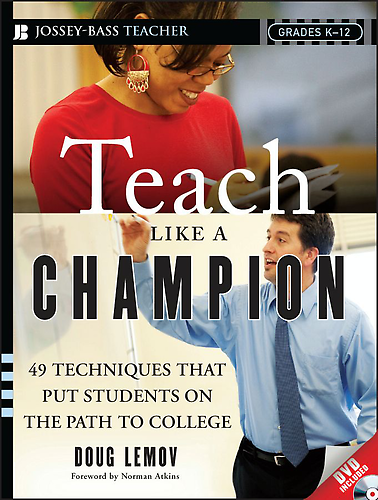 Lemov claims that after observing hundreds of masterful teachers, he found that many of them were using the same strategies and activities, which he describes in Teach Like a Champion. There is also an online supplement with videos of the teachers in question using the techniques. In my opinion it is worth buying the book just to get access to this resource. Teach Like a Champion is not perfect. It can feel a little cultish at times (all the techniques have names, which Lemov explains as being necessary in order to clearly convey what he is talking about, but names like “at bat” or “pepper” sometimes feel a bit silly), and the focus is very much on the US K-12 system. However, most of the techniques are universal, and I have successfully implemented them with both small group eikaiwa kids and university classes. All things considered, Teach Like a Champion is one of the best books on teaching I have read (I’ve actually read it twice, and am about to re-read it again to refresh everything), and a couple of friends who have also read it feel the same way. Unfortunately it doesn’t seem to be available through Amazon.co.jp, so I ended up buying the Kindle version from Amazon.com and reading it on my iPhone, but it’s worth getting a copy sent from the US. For a free postage and packing option, check out The Book Depository. Choose Your Own Adventure readers -in class! Good to read that Teach has also “landed” in Japan. The Dutch edition will be launched in on january 18 2012…. We have big plans for Teach and so far teachers have welcomed the 49 techniques with open arms…. Great to hear. How did the Dutch edition come about? We could do with a Japanese language edition here too!